Linen ladies dresses are not just a fashionable linen item but a whole philosophy dedicated to the harmony of style and comfort. Lightness and the exquisite simplicity of the silhouettes are the essences of Miitu brand. In our clothes, we collected everything that the modern woman seeks - comfort, beauty and elegance. 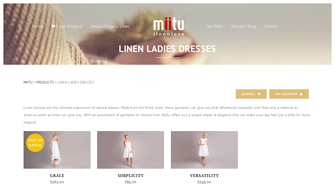 You can choose such interesting solutions for your wardrobe in our Miitu online store.